Betclic was formed in 2005 by Nicolas Béraud and at that time he only had one employee and an investment of three million euros. His business took off though and three years later Mangas Gaming purchased 75% of Betclic for 50m euros. Further investment in the company came from SBM the following year. The site went on to become the leader in online sports betting in France. Since 2010, Mangas Gaming are now known as BetClic Everest Group S.A.S. Since formation Betclic have always been keen to sponsor football teams and this has seen them involved with French Ligue 1 sides Lyon and Marseilles and also with multi- Italian champions Juventus. The website is operated by Betclic Everest (Gibraltar) Limited, Company number 104684 and its registered office is at 57/63 Line Wall Road in Gibraltar. The site is regulated and licensed by the Malta Gaming Authority and also the UK Gambling Commission under Remote Operating License 000-039188-R-319326-007. When you take the decision to join the Betclic site, all you need to do is complete the registration and then there’s a welcome offer to hopefully get you off to a good start on the website. At Betclic, the first bet you make has a bit of the pressure taken off it because if it loses, then you receive your stake back as a free bet. This means that you can opt to go for an outsider that you really fancy knowing a big profit is on its way if it wins and if it doesn’t you don’t lose anything as a free bet is on its way to you. This is a common welcome offer and can certainly get you off to a good and profitable start with the site. The maximum free bet is £30, please be aware offers like this can and do change on a regular basis so check the website for more details. Betclic has so much to offer to its customers whether it be tips from their ambassador Ruud Gullit to the huge number of betting opportunities that are on the site each and every day whatever the time of day. There are plenty of promotions on offer all the time and some of those, particularly the Colossus can change your life forever. The sportsbook covers all the top sports that you will be wanting to place bets on and with plenty of payment methods available, financial transactions are safe and secure. It’s also well worth getting hold of their app so you can take advantage of more promotions and be playing and hopefully winning even more. With any site that includes financial transactions it is important that everything is safe and secure. Thankfully that is the fact when it comes to the Betclic website. If you do have any problems or queries, then there is a fair bit of information on the site and you can easily contact them as well so there shouldn’t be any problems. There are several payment methods that can be used to deposit cash into your Betclic account and make withdrawals. You can use Visa, VisaElectron, Mastercard, Maestro, Bank Transfer, Skrill, Neteller or Paysafecard. That’s a good range and you shouldn’t have problems finding one you can use. Just how long any withdrawals will take to get back to your chosen payment method depends on which one you are using. In order to comply with UK Regulatory policies, you will need to provide the website with valid proof of identification prior to making your first withdrawal. This website has an attractive look to it which is always a good start as far as this reviewer is concerned. It’s red and white in colour and navigating your way around the site isn’t a problem at all. 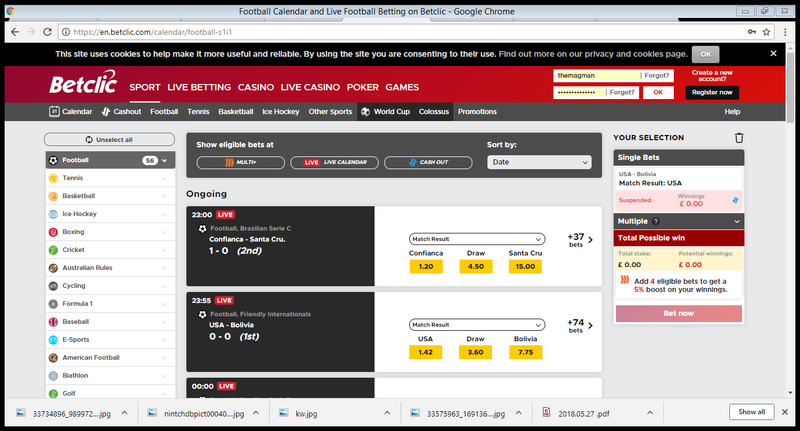 At the top of the screen are the options to go to the sportsbook or right to the live betting section of the site which is where the action really gets exciting. It’s easy to find the sport that you want to place a bet on and the odds are in yellow boxes on white backgrounds with everything totally clear. There are always rules that you need to abide by and when you are on a sports betting site there is no escape from them. That’s important and it’s extremely helpful to have a good look at the rules before you start playing on this site or there could be some costly errors made. Just think of the first time you found out that a football bet only counts for 90 minutes unless you specify otherwise. This site has lots of help available when it comes to the rules that apply to each of the sports that are covered on this site. Most of the rules apply to all the sports on the site, for example it isn’t possible to cancel a bet once it has been made, though there is the possibility that the Cash Out feature may be in play, so you may be able to use that while incurring a small loss. When an event is cancelled or postponed your bet is still valid if the event eventually takes place within 36 hours of its original starting time though this doesn’t apply to tennis and in badminton and athletics the bets remain valid until the event is permanently cancelled. As you can see there’s a whole stack of rules on the site so even though reading terms and conditions isn’t the most exciting past-time, it can help you win money. There’s never going to be a dull moment when you pay a visit to the Betclic site. It’s full of betting opportunities and it doesn’t matter whether it is the sun or moon that is shining, there will always be something to try and win some cash on. It has some excellent promotions right from the moment that you register with the Betclic website and there is plenty of help available to guide you along the way including lots of helpful statistics. All of the top sports that enthral us on a daily basis can be found at the Betclic Sportsbook. If you are a big football fan, then you will be thrilled at the number of betting opportunities on the site. The same applies if you love horse racing, cricket, rugby, boxing or are a big fan of all the Stateside sports such as Ice Hockey, Basketball, Baseball and American Football, so get ready for some late nights keeping up to date with your bets. However, that’s not all because you can also bet on sports such as Biathlon, E-Sports, Volleyball, Futsal and Handball. There are statistics available on all the sports the site covers. You can also place some novelty bets and have a gamble on politics, television shows and wo the next James Bond will be. The betting industry has seen so many changes in recent years. New ideas just keep on coming along and they can all result in customers getting huge cash wins. The easiest bet you can place on the site is a single bet, say for example, Brazil to win the World Cup. It’s easy to place a bet on this site, just click on the odds of the selection you want to make, and a bet slip comes up and you can fill this in with the stake you want to make. If Brazil win the tournament, then you will be paid within minutes of the final. To win at higher odds you can place doubles where there are now two selections in your bet and if this is a win double, then both selections have to win for you to get a return. If it’s an each-way double, a return is possible if the selections win or get placed. The more selections you make, the higher the odds and your return will be, but the higher odds also mean more chance of the bet going down, especially if they all have to win. Therefore, it’s a good idea if you go for the many system bets that are available on the Betclic site. For example, if you have four selections you can place a Yankee bet which has five doubles, five trebles and a four-fold. This helps as you don’t need all the selections to win to get a return. You can keep on adding selections and place other systems bets such as a Lucky 31 or 63 and if they win, then you really will be delighted. Football betting tends to dominate most sportsbook such is the popularity of the game. Back in the day there was a huge limit on the number of games that you could bet on and the thought that in a few years you’d be able to place bets on a Serie B game in Brazil wasn’t really thought of. Now betting on football games all over the world at all times of the day is an everyday occurrence. All of the top leagues are covered but that’s not all because the site covers the lower leagues and also reserve and youth games too giving customers betting opportunities aplenty. It’s not just the huge number of games that you can bet on that is so enticing but also the number of different kinds of bets that are available on each game. When it comes to a top Premier League game or an international, there’s over 100 different markets available and the bonus is that many don’t require you to predict the end result of the game. You can bet on players to score at any time in the game or whether there’ll be a penalty in the match. Also, there are bets available on how many goals will be scored, how many bookings or corners and if really unsure about the end result, go for the double chance bet where you can bet on a team to win or draw. It’s fantastic having so many events to bet on at Betclic but it’s the live betting side of the website where the excitement goes into overdrive. In the past betting on a football or rugby match while it was taking place just wasn’t available. The arrival of in-play betting changed all of that and this website has a whole section dedicated to live betting. There is always a good number of live events to bet on and they come from all over the globe at all times of the day. As each event takes place there is the opportunity to be continually placing bets and in sports such as football and tennis where there are plenty of available markets, you can be kept very busy indeed. The odds available for every market will be constantly changing during the event depending on what is happening on the field of play. The longer a game stays level the odds on either side winning will lengthen and the odds on a draw shorten. This can result in much better odds being given for your selection, so the temptation will be there to bet on them again if you still believe they will eventually be the winners. Live betting also gives customers the opportunity they didn’t have in the past and that is to place bets on the other team if your selection goes behind. You may still be able to get a profit out of the match or at least reduce your losses and as you will read soon, there’s the exciting Cash Out feature available on this website. You can bet on football games right up to the 90th minute as you pray for that late goal. Being able to actually see the event that you are following the live betting on adds even more to your enjoyment of the site. Live streaming is available on the Betclic site, but you do need to be a registered customer and have made at least one deposit into your account. There are other restrictions sometimes, for example, during the Australian Open tennis tournament you needed to have placed a £5 bet. There are plenty of reasons to be joining the Betclic website. No one wants to join a site that has a small number of betting opportunities available and this site is in absolutely no danger of falling into that category. You might not be too familiar with some of the teams you can bet on but with plenty of information available, you can still make a good decision on who to bet on and that’s always good to see on any website of this nature. There is a good range of sports that you can place bets on at Betclic and lots of promotions available. The app is a good addition to the site and allows you to be playing the site here, there and everywhere and there’s good customer support. There are some great promotions on the Betclic website. When you place bets on the top European football competitions at the weekend on your mobile you can receive 25% of your mobile net-winnings. This covers all the top leagues and you simply need to place single mobile bets with minimum 1.8 odds and a minimum five pounds stake. The maximum bonus is £25 per week, so roll on the football season. The Multi+ promotion adds extra amounts to your winning accumulators. This starts off with a 5% bonus paid out on winning five-folds and increases to 10% if your six-fold comes up. The more selections you add that prove to be winners, the larger the bonus paid out as part of this promotion. By the time you get to an all-correct 12-fold the bonus is up to 60% and when it gets to a winning accumulator that contains at least 16 selections, the bonus reaches the maximum 100%. promotion covers a number of sports and there’s a chart on the website that fully shows how much the bonus is for each kind of bet. The selections have to be at odds of 1.2 or greater. If you want to get a really large win then there’s the Colossus promotion. You could win £1m if able to correctly predict the scores of six football matches. Other offers of this type include the chance to win £4,000 for correctly predicting the correct score in six tennis matches. Live betting is exciting enough but the addition of the Cash Out feature makes it even more thrilling. Here’s a feature that allows you to end your bet before the actual event has come to its natural conclusion. In fact, you can even end the bet before the event starts if you get cold feet over your selection, though you will make a slight loss but it’s better than your fears being proved right and losing everything. 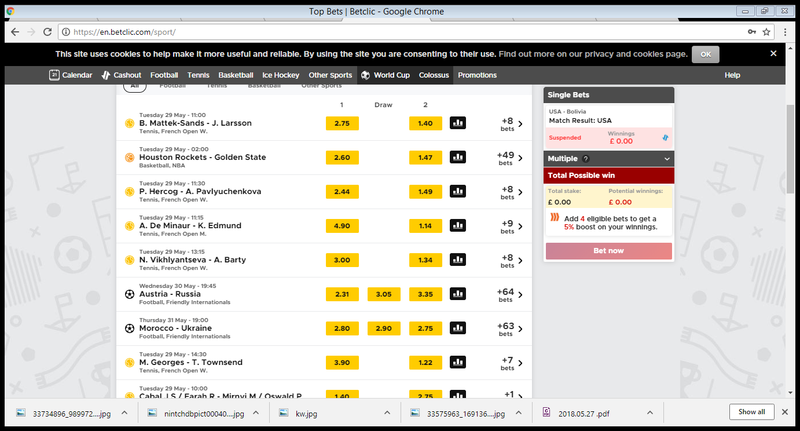 The Cash Out feature is available on selected sports and betting markets on the Betclic website. All you have to do is look out for the Cash Out logo and if It’s there then things are going to get rather interesting from now on. This is a bet where you have to keep an eye on what’s happening all the time. Just how much the site will offer you for Cash Out depends totally on what is happening in the event you are betting on. If your selection gets into a lead then the amount you can cash out for will increase and it may be possible, particularly as the minutes tick down, for you to cash out at a profit. It won’t be the full value of the bet but if you think your selection won’t hang on for the victory then you have the opportunity to end the bet and then smile your head off if they don’t win in the end. At Betclic they have Partial Cash Out which means you can cash out part of your bet and leave the rest of it running. This is allowed as many times as you want until the Partial Cash Out amount remaining is lower than £1. Cash Out can’t be combined with other promotions and that includes Free Bets and when using this feature any bets that are cashed out won’t count towards any wagering requirements. Free bets are often a way to allow customers to get another bite at the cherry and get the win that they are seeking though of course it could just end up being another loser. Usually they come after accumulators fail by one selection to be a winner or your horse falls or unseats its rider. Aside from the free bet offer in the welcome offer, there aren’t any free bets offers on the site. They instead concentrate on other promotions as mentioned elsewhere in this Betclic review. With so much happening on this site whether it be promotions or technical issues, then it’s likely that at some point in time you are going to need a bit of help along the way. If that is the case, then you can go to the top right-hand corner of the screen where the ‘Help’ button is situated. There’s a drop-down menu that offers customers the chance to access the FAQs part of the Betclic website. It’s not the most extensive list that this reviewer has seen but it covers ‘Register,’ ‘My account,’ ‘Bonus,’ ‘My bets,’ ‘Deposits/Withdrawals’ and Cash Out. More help is available with a dictionary, though the words aren’t in alphabetical order so not sure on that one, but the information is useful. There’s are also terms and conditions available to read and if you are still stuck then you can email them at support@betclic.com with a response within 24 hours guaranteed. The site also has plenty of statistics available that will be of great use when you are making your selections, particularly when it comes to some of the teams that you may not be too familiar with. By now you will hopefully be thinking that joining up with the Betclic Sportsbook is going to be a very good idea. You do need to be a registered member in order to take advantage of all the excitement that this site has to offer. It’s not going to take you too long to do just that if you follow these easy steps. Once that important decision has been taken and you decide that you just have to be a member of the Betclic site, you need to look in the top right-hand corner of the site where there’s a box that allows you to register with the website. Click on that and up comes a new page that has the details you need to fill in to register with the site. It’s the usual set of questions that you have probably already answered many times before. You know the routine, you’ll be asked for your name, age, address, the currency that you wish to use on the site, your telephone number and then username, password and email address. There’s also a security question to answer with the list including your favourite football team or your mother’s maiden name. Once that is completed it’s time to sort out the financial details concerning the payment method that you wish to use with the site. You will need to send some documents to verify your account before cash withdrawals can be made. Now you’re a member of the Betclic site and you can start making deposits and claiming the welcome offer. There’s lots happening all the time on the Betclic site that you won’t want to miss anything important. That problem is easily solved because you can access the mobile version of their site on your iphone. That way, wherever you are you will be able to follow all the action, place your bets and see how your selections are progressing. It’s easy to navigate your way around so just head to the App Store and away you go. There are also some mobile related offers on the Betclic site so that’s another great reason to get hold of the app. As this review has explained previously, this site has lots of promotions on offer to its players. When there are big events such as a World Cup or Olympics, then those offers will be even more evident. It’s important then to keep an eye on the ‘My Account’ part of the website to check to see whether you have been lucky enough to receive any bonuses or promotions as you’d hate to miss out on them. Review on Betclic checked the April 22, 2019 by SportyTrader with an overall score of 8.1 out of 10.